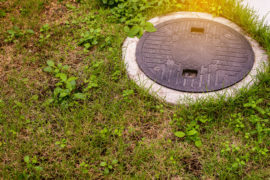 Many homes, especially ones outside the formal city limits, have septic tanks instead of being on the city sewer lines. With a really well-designed septic take can be expected to not have any major issues, however, when they are dealing with additional items that we might throw at them, it’s possible to create an issue. We throw a lot at these tanks way beyond simple human biological waste such as excess water, soaps and detergents, kitchen waste and sometimes even things like solvents and other non-biodegradable items. Excess water in the tank—if you have inefficient water use by using too much water from baths and showers along with output from dishwashers and washing machines it can create a situation where solid wastes can’t break down before the water level rises to the point that the solids pass out of the tanks into the distribution tubes, blocking them. You can prevent this by implementing habits such as shortening the length of showers and using “low flow” shower heads, as well as spreading the laundry out over a few days instead of doing it all in one day. Non-biodegradable items—by flushing non-biodegradable items you are, in effect, filling up your tank space with items that will not break down and be forced into the distribution system. It’s important to only flush those items that will break down. Keep it to bodily waste and toilet paper and keep out the kitchen waste, as well as flushable items such as tampons, diapers and paper towels. Detergent—using too much detergent can mean a problem for your pipes and your tank because of the phosphates. Use gels and liquids instead of powers. Be sure to have your septic tank pumped every two to four years to ensure maximum efficiency. Looking for Water Saving Opportunities in Your Business?Businesses Have Plumbing Issues Too–Commercial Plumbing!